These vocabulary words are from the Wordly Wise Book 4, Lesson 17: An African Folktale. 10 Vocabulary words were chosen for my 4th grade ELL classroom. 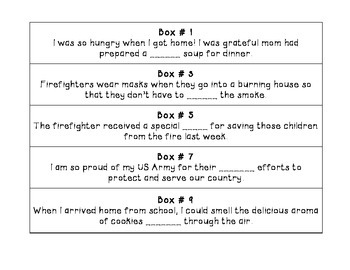 Instructions: Cut out the sentences and place them around the room. Each student gets a boxes worksheet. Start each student at a different station (sentence) and play some music. After 1-2 minutes the students switch stations. At each station, the student reads the sentence and puts their answer in the corresponding box. Make this easier or more difficult by adjusting the amount of time given, assigning partners, allowing a list of definitions, or eliminating the vocabulary word box.